Read more about the Emergency Assistance services available to you. Thousands of people have been evacuated in the wake of an eruption of Guatemala’s Fuego Volcano. If you're in Guatemala and need assistance, please call our Emergency Assistance Provider collect at +1-855-286-8348 or toll-free at +1-443-279-7335. If you have a question about how your travel insurance policy works in light of the natural disaster, please call RoamRight Customer Service at 1-877-687-7170 (toll free) or 1-201-537-9871 (collect). Hurricane Michael is currently affecting the Gulf Coast of Florida, resulting in high storm surges, strong winds and heavy rain that will cause damage and affect travel plans. Hurricane Michael was named a hurricane on October 8, 2018. Only travelers who purchased travel insurance prior to October 8, 2018, are covered for claims related to Hurricane Michael. If you purchased travel insurance on or after October 8, 2018, you will not be covered for any expense caused by Hurricane Michael. If you purchased travel insurance prior to October 8, 2018, and need to file a claim related to Hurricane Michael, follow these instructions. If you're in Florida and need assistance, please call our Emergency Assistance Provider collect at +1-855-286-8348 or toll-free at +1-443-279-7335. If you have a question about how your travel insurance policy works in light of the hurricane, please call RoamRight Customer Service at 1-877-687-7170 (toll free) or 1-201-537-9871 (collect). Hurricane Florence was named a hurricane on September 4, 2018. Only travelers who purchased travel insurance prior to September 4, 2018, are covered for claims related to Hurricane Florence. If you purchased travel insurance on or after September 4, 2018, you will not be covered for any expense caused by Hurricane Florence. If you purchased travel insurance prior to September 4, 2018, and need to file a claim related to Hurricane Florence, follow these instructions. If you are currently traveling and experiencing a travel emergency,please call our Emergency Assistance Provider collect at +1-443-279-7335 or toll-free at 1-855-286-8348, or if you have wi-fi access, you can call using the Emergency Assistance feature in the RoamRight App. You can also find the latest alert information in the RoamRight app as well. We've compiled a short list of helpful information for RoamRight customers experiencing problems created by a significant event, such as a hurricane, earthquake, snowstorm, or others. Please refer to this page for easily accessible information about seeking help, filing a claim, and getting up-to-date information on the situation. If you are experiencing an emergency and need immediate help, please call our 24/7 assistance provider using the information below. Read everything you need to know about filing a claim by visiting the Claims Information section of our website. The U.S. DOS Bureau of Consular Affairs also maintains a list of Travel Alerts & Warnings. Travelers can search by location or review the entire list. The same department also hosts a website for travelers to get help in the event of an emergency, anything from lost or stolen passports to a natural disaster. Homeland Security also maintains a website related to overseas travel and alerts. They offer a list of international travel tips as well. Here is another U.S. government travel site with links to many travel resources. One of the most useful travel resources is the RoamRight mobile app. 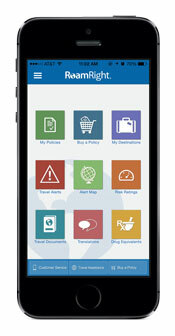 With the mobile app, travelers have access to all of these important resources in one place. As a partner, you can get access to all of the features in this award-winning app available on the App Store and Google Play. With detailed destination and security information, this should be your go-to resource for up-to-the-minute travel, health and security advice and information.